Restore Foam Dressings with Silicone by Hollister provide optimal fluid handling performance for individuals with moderate to heavily exuding acute and chronic wounds such as pressure ulcers, diabetic ulcers, venous stasis ulcers, leg ulcers, malignant wounds, surgical wounds, donor sites, partial-thickness burns, skin tears, skin abrasions, and post-operative wounds. Their large perforations allow for rapid absorption of exudate, while the specialized foam wicks exudate effectively wicks exudate away from the wound bed. 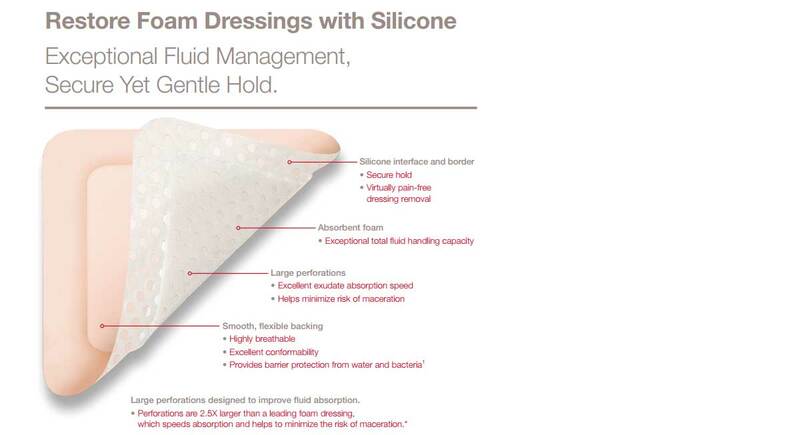 Restore Foam Dressings with Silicone feature a smooth, flexible backing, making for an extremely breathable and highly comfortable wound dressing. The dressings are also very flexible, allowing them to cover those typically hard-to-dress areas. Vitality Medical also carries other foam dressings, such as the Mepilex Border Dressing and Allevyn Adhesive Dressing. Product Numbers: 520003, 520005, 520000, 520001, 520023, 520025, 520027, 520020. Wound Care Catalog describes the wound care dressings available from Hollister. 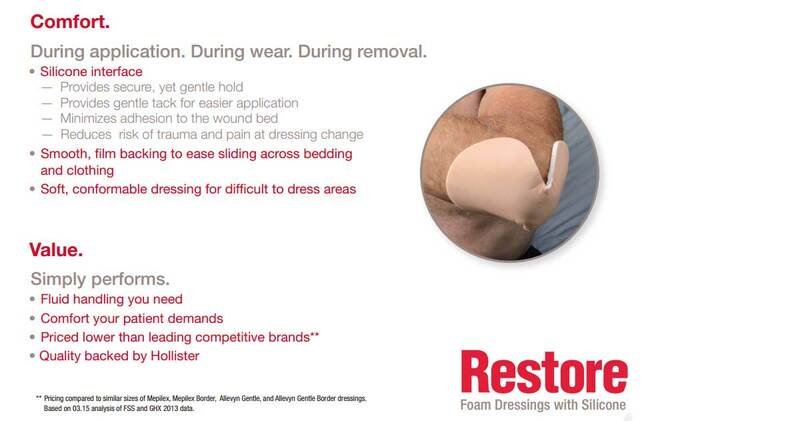 Restore Foam Dressings Brochure contains features, benefits and options for these silicone foam dressings.